Location of Hike: Cache Meadow, Grouse Point and Trail "X"
A fabulous day of fall hiking! After my successful “epic” trip last weekend (~19 miles and 5200+’ of elevation gain), I decided to do a little more aggressive day hike than I have done in the past. I decided to hike the other end of one of the trails we did last week (Grouse Point) and also explore a new trail (Cache Meadow). 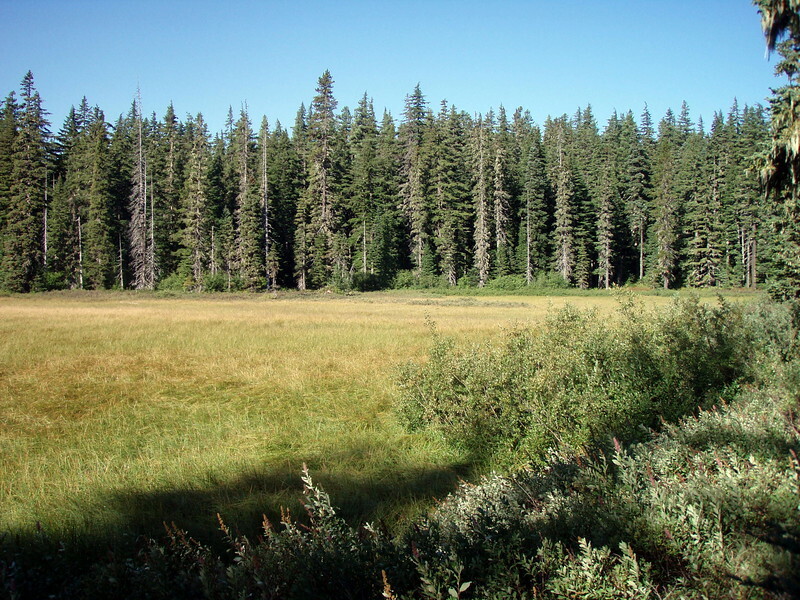 I had done parts of the Grouse Point trail about 4 years ago during a backpacking trip to Serene Lake, but I hadn’t explored the Cache Meadow trail at all. We went to Cache Meadow, but then went back to the lake. It started out in the morning rather chilly, but it was clear. I missed the trailhead the first time I drove down road 4635, but found it on the way back. Bodie was very eager to get going (as usual). We started down the Cache Meadow trail about 10:15 or so, a beautiful trail through some nice forest, and relatively level going. It goes uphill just a bit before you get to Cache Meadow. Once there, there is a somewhat confusing bunch of trail junctions. I took the 517 junction, which essentially bypassed Cache Meadow “proper”. From there we wound our way up to the ridge that the Grouse Point Trail follows. The trail is another very nice, very scenic trail that is mostly flat, with a little up and down along the ridge. There are a couple spots where you can look North and see the view across the Roaring River valley. When getting close to Grouse Point, the trail veers away in some very thick rhodies. Although there is supposed to be a side trail to Grouse Point, no one appears to be able to find it. I was determined to get to Grouse Point, but the rhodies just seemed to get thicker as you get closer to the point, and I finally decided to forget it. I looked at several possibilities for side trails, but all of them quickly disappeared in the thick rhodies. I didn’t have any loppers with me, otherwise I probably would have cut my own path to Grouse Point. I’m sure the view from there is probably spectacular. 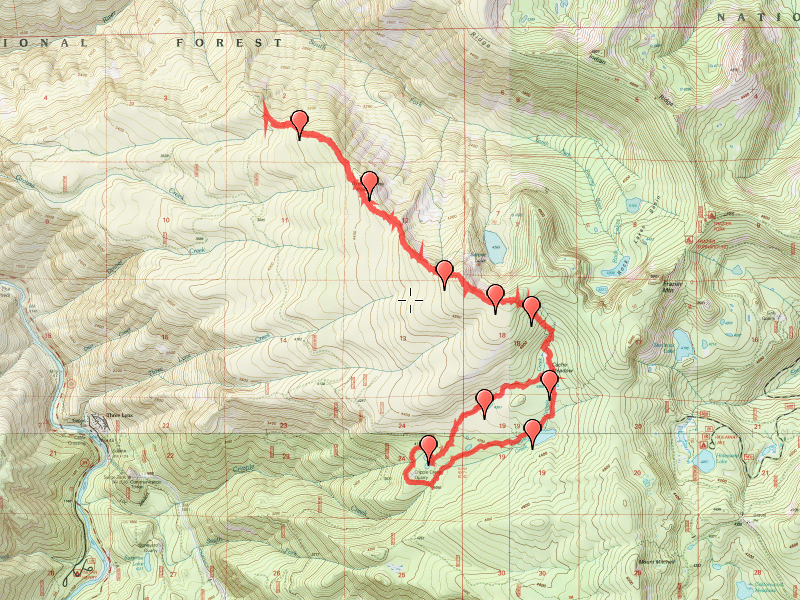 I hiked down Grouse Point to the junction with the Dry Ridge Trail, the point at which we hiked last weekend. I had lunch there, and then turned around and came back. The forest once you come down off Grouse Point is much different. Very little undergrowth, just blowdown and dirt/duff mostly. One interesting note: Most of the way, it was rather breezy. So much so that the trees were creaking and groaning. 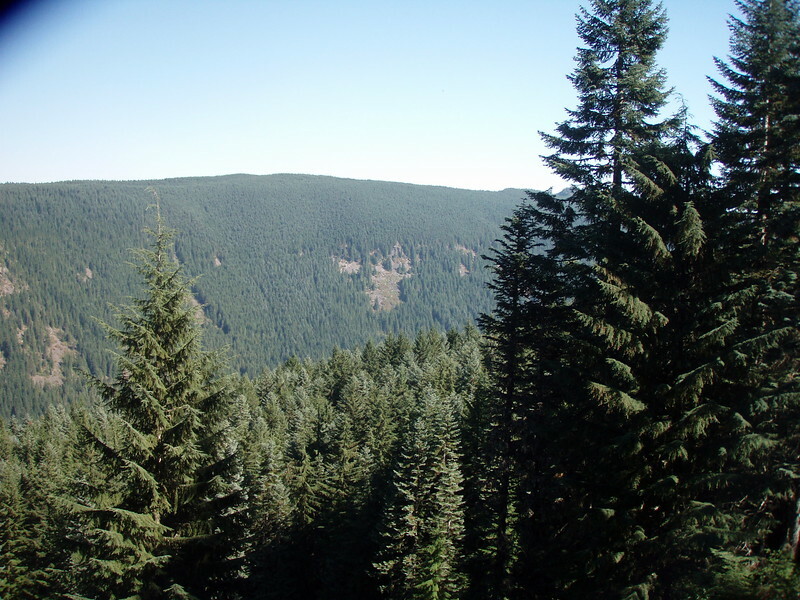 But, when we got on the west side of Grouse Point, the wind disappeared and the forest was very quiet. Once back to Cache Meadow, we took a different route home. The forest service maps show a Trail “X” on the south side of the meadow cut, so we came back that way. The trail was easy to follow, once we found the junction at the burned out shelter at Cache Meadow. 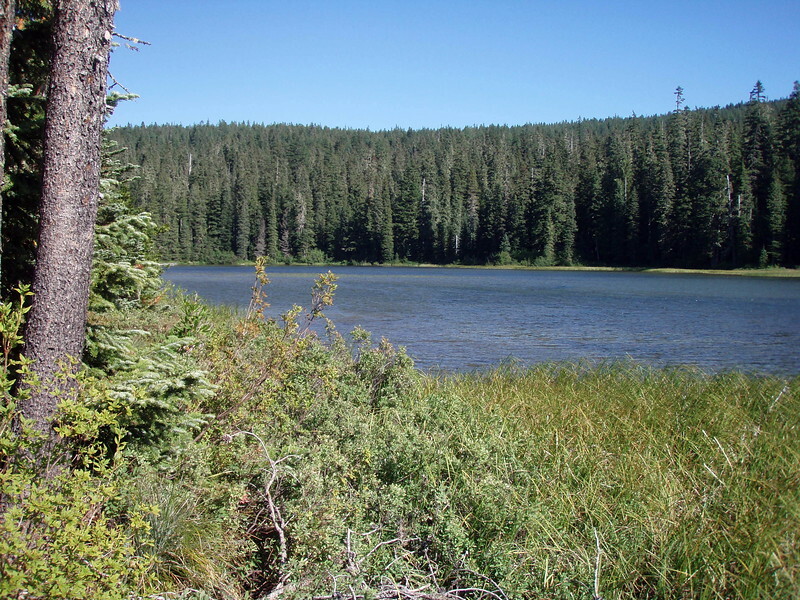 We hiked past a nice rather large, shallow, un-named lake with a couple of campsites. There is supposed to be a trail going north towards the end of the trail, but we missed it, and hiked out to the 4635 road and back to our starting point. The only thing that could have made the day better was a little less haze in the air. The overlooks where a little hazy, but not too bad. The temperature was just perfect-not too hot, not too cold, and most of the day we had a nice breeze. The hike was great-Not too much elevation gain/loss, and some beautiful scenery. By the end of the day, I was tired, but still feeling pretty good. My feet held up well and so did my legs. I was very happy that I felt so good after a pretty long day of hiking.